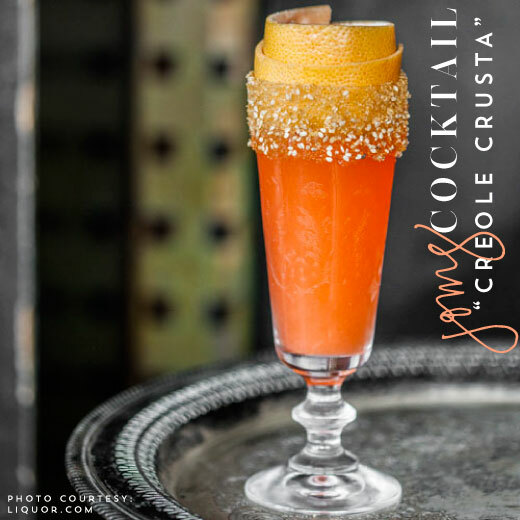 A creole crusta. Doesn't it sound fun, festive and full of flavor? I really should have saved this for a day closer to Mardi Gras, but I couldn't wait. Looks spicy! Mix the turbinado sugar and toasted benne seeds together. Coat the rim of a cocktail glass with lemon juice and coat it in the sugar and seed mixture. Fill the shaker with ice and the remaining ingredients. Shake, and double strain into the rimmed cocktail glass.